Unfortunately, I didn’t get around to seeing his exhibition at Linda Hodges before the last day, but Alfredo Arreguin is a local painter worthy of a closer look. Alfredo Arreguin. The Eagle and the Serpent. Oil on canvas, 2008. 36 x 30 inches. Via Linda Hodges Gallery. A Mexican-born painter who has lived and worked in Seattle since the 1950s, Arreguin is associated with the Pattern and Decoration movement that flourished in the 1970s. Some of his paintings seem to overtly reference the work of fellow UW alum Chuck Close. But Arreguin’s jewel-toned matrices also have an affinity with Spiritualist painters such as Augustin Lesage as well as the visionary universes of indigenous Peruvian painter and curandero Pablo Amaringo, who passed away earlier this week. 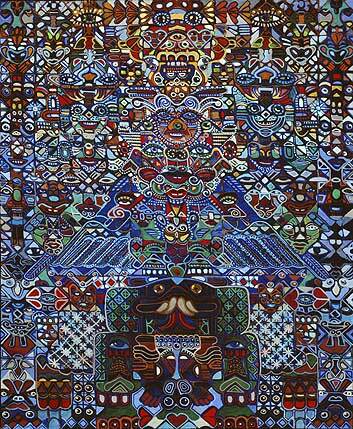 The current solo exhibition at Linda Hodges is Arreguin’s sixth with the gallery. You still have two hours to see it if you’re so inclined. ~ by emilypothast on November 28, 2009.